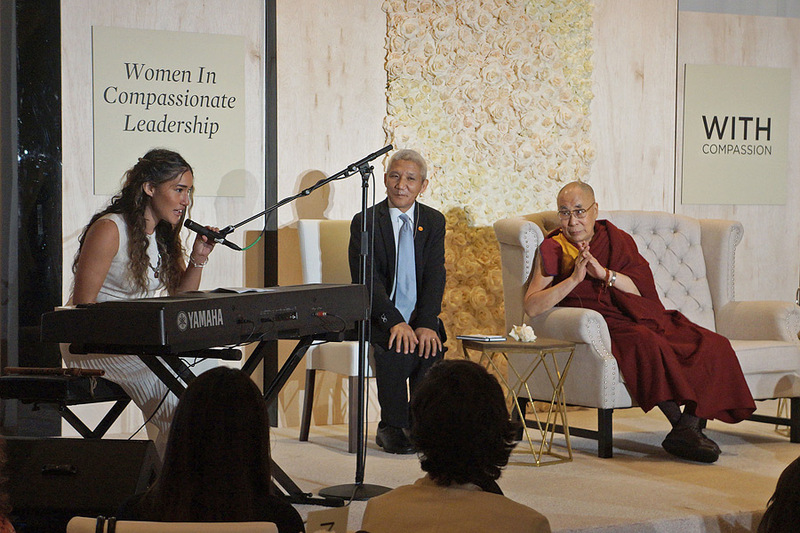 (TibetanReview.net, Jun20, 2016) – Tibet’s exiled spiritual leader, the Dalai Lama, on Jun 17 took part in a ‘Women in Compassionate Leadership’ Breakfast in the US city of Los Angeles, attended by some 275 people, including influential women, CEOs, entertainers, and media representatives. He was introduced to the event with a brief video presentation depicting his life and activities. Organizers Mimi and Maribel Unanue told the audience how moved they were when they visited the Dalai Lama in Dharamshala and thanked him for encouraging women to take up compassionate leadership roles. First Lady of Anaheim, the Mayor’s wife, Julie Tait, then asked the gathering to welcome the Dalai Lama as he took his seat on the stage. Q’orianka Kilcher then sang from the piano about the interdependence between the earth, sky, oceans, animals, and forests, as well as the gift we have to raise the next generation. The Dalai Lama responded by saying the flute recital by her which preceded it evoked in him the vast grasslands of Tibet. He added with a laugh that she had already sung what he was going to say. Later in the afternoon, the Dalai Lama met with friends and family of Anaheim Mayor, Tom Tait. He told them that while America was the leader of the free world, he hoped that it would also become the leader of a movement for peace and compassion. He said he was impressed that Anaheim had declared itself a city of kindness, “because peace in the world will only come about through inner peace, just as global disarmament will only be achieved by beginning with inner disarmament”. The Dalai Lama also met with friends and family of California Senator Janet Nguyen who told him that there were two million Vietnamese in the USA and that the Vietnamese community in Orange County, where he was now, was the largest outside Vietnam. On the following day the Dalai Lama visited the Vietnamese community in the county which is referred to as the Little Saigon. Some 6,000 people attended the Chua Dieu Ngu Buddhist temple event in Westminster. 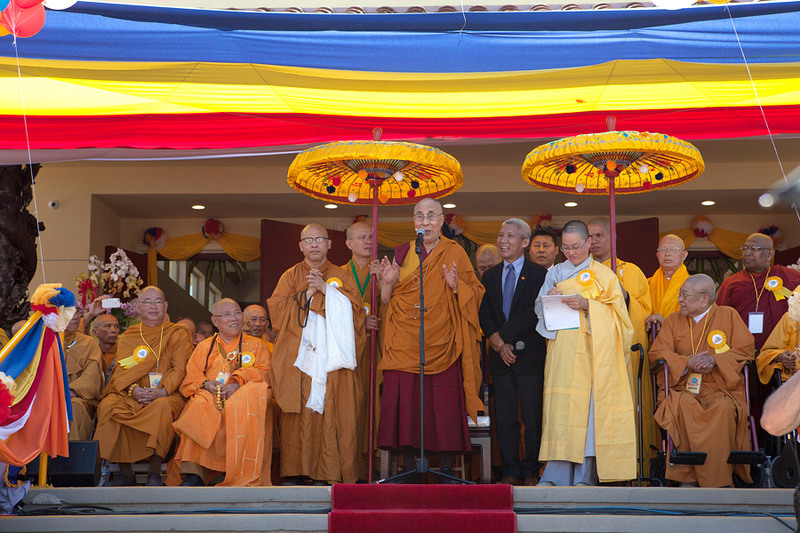 Its abbot, Thich Vien Ly, had traveled to India to meet with the Dalai Lama last year, inviting him to Little Saigon to help christen the temple which officially opened on Jun 19.